Copyright 2019 WPLN. To see more, visit WPLN. The medical profession is one that mandates hands-on training. Doctors and nurses need to experience everything from cradle to grave while they're in school. But deathbed education often gets short shrift. 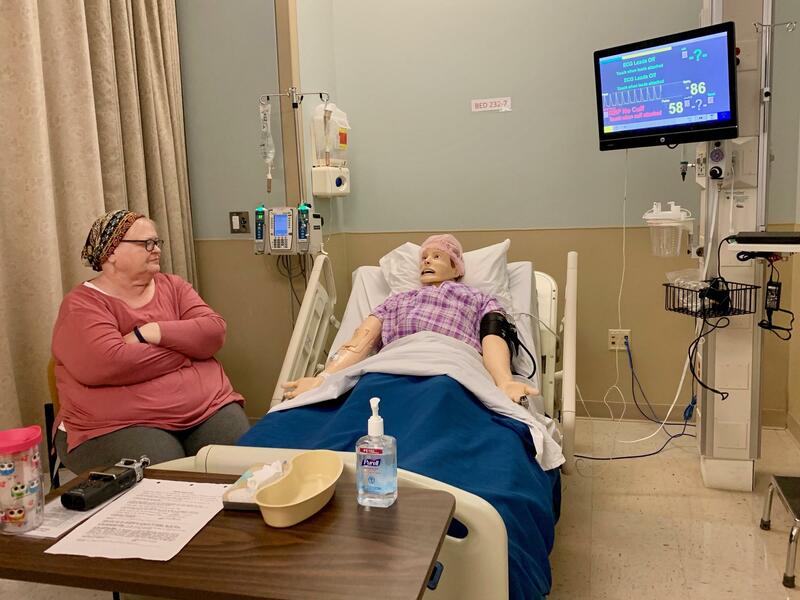 As Blake Farmer of member station WPLN reports, some nursing programs are attempting to make end-of-life education more of a priority. And just a note - this story includes the simulated sounds of dying. BLAKE FARMER, BYLINE: There's a sound near the end. Some call it the death rattle. Nursing professor Sara Camp has pretty well perfected it. FARMER: People stop swallowing. The lungs fill up. There can be moaning. SARA CAMP: So you get all that noise. And that's really distressing for family members. FARMER: Camp and other instructors at Nashville's Belmont University are gurgling into microphones in a dark closet. In real time, the sound comes out of lifelike robots in hospital beds on the other side of the wall. 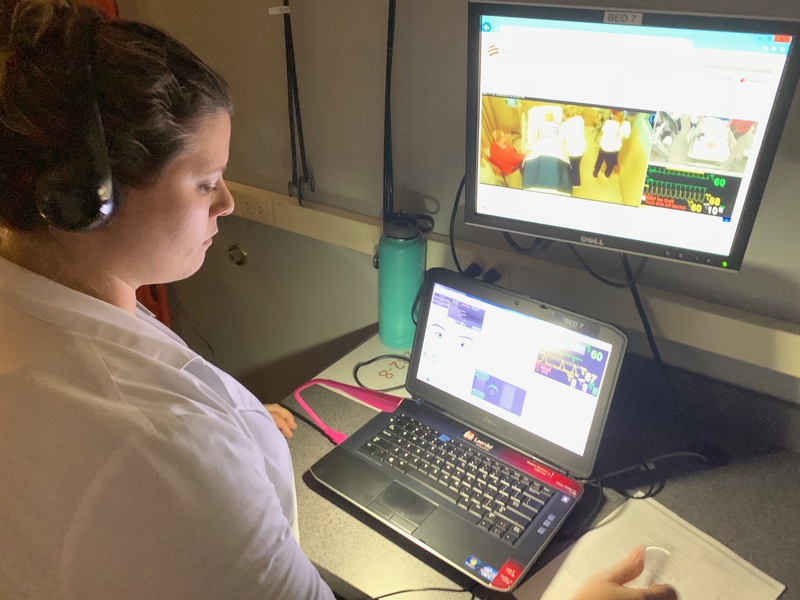 The instructors watch video monitors of the students responding as teachers control the stats for the robots' breathing, pulse and blood pressure. Other than administering morphine, Camp says there's no exact prescription for nursing students to follow. CAMP: In this one, they have to focus on communication when there's not that much to do. And it challenges them. FARMER: In response to surveys showing death anxiety among young nurses, Belmont started hiring actors to make these end-of-life interactions more realistic. Vickie Bailey plays a grieving daughter. There are family dynamics for nurses to navigate, explaining to Bailey's character how her mom signed a Do Not Resuscitate order. VICKIE BAILEY: No cancer - didn't want it to come back. FARMER: The student, Sara Lindsay, sits on the bedside and puts a hand on Bailey and warns the end is near. SARA LINDSAY: So now would be a good time if you have prayers or anything that you'd want to say. FARMER: The monitors stop beeping. Everyone sits in silence. Half a dozen beds are going at the same time in the simulation lab. All the students gather to debrief afterward. Zacnite Vargas says she second-guessed herself. ZACNITE VARGAS: Should I say she's dying, she's dead or she's passed? I don't know, like, how to be, like, straightforward with it. FARMER: A recent academic review of nursing textbooks found most gloss over this standard part of the job. And researchers say more than a quarter of nursing students never treat a dying patient. That's prompted a new trade group to offer mid-career education on end-of-life care. Some schools, like Belmont, have reworked their curriculum. Camp tells the students, many just weeks away from their first job, to be cautious while also showing compassion to families. CAMP: They may not remember what you say, but they'll remember how they feel because you were there. FARMER: It's important work that Camp says more students should rehearse. For NPR News, I'm Blake Farmer in Nashville. Transcript provided by NPR, Copyright NPR.